Coconut Burfi: Coconut Burfi is a very tasty and famous Indian dessert made of fresh coconut. 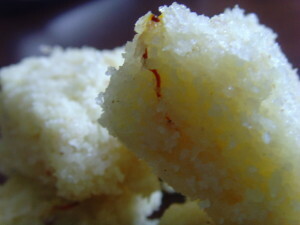 Coconut burfi is called by the name Khobbri mithai in Kannada and Naralachi Vadi in Marathi. It is one of the varieties of the burfi. Coconut barfi is a traditional sweet barfi recipe of desiccated coconut powder mixed with milk and sugar. The coconut powder is mixed with sugar and ghee and blended together to make barfis. Melt 1 tbsp ghee in a pan, on medium heat. Roast the broken cashews till golden brown. Grease a plate/tray with ghee. In a wide bottomed non stick pan, add sugar and water. Cook the sugar mixture on medium heat. Cook till sugar dissolves completely and starts bubbling. Stirring continuously, cook the sugar syrup till it reaches single string consistency. Stir continuously, till bubbles star forming at the edges. Add in the ghee, green cardamom powder and cashews. Cook the mixture till it starts thickening and starts leaving the sides of the pan. Transfer the mixture to the tray. Cut into squares when the mixture is still warm. Cool down the coconut burfi to the room temperature. Coconut burfi is ready to be served. Coconut Burfi can be stored for about 2 weeks, it in airtight container. If you have any queries regarding the Coconut Burfi recipe, please leave a comment.